September 6, 2017 – A new X-ray study has revealed that stars like the Sun and their less massive cousins calm down surprisingly quickly after a turbulent youth. This result has positive implications for the long-term habitability of planets orbiting such stars. The decline in energetic activity may provide a hospitable environment for the formation and evolution of life on any orbiting planets. Specifically, the researchers examined 24 stars that have masses similar to the Sun or less, and ages of a billion years or older. (For context, the Sun is 4.5 billion years old.) 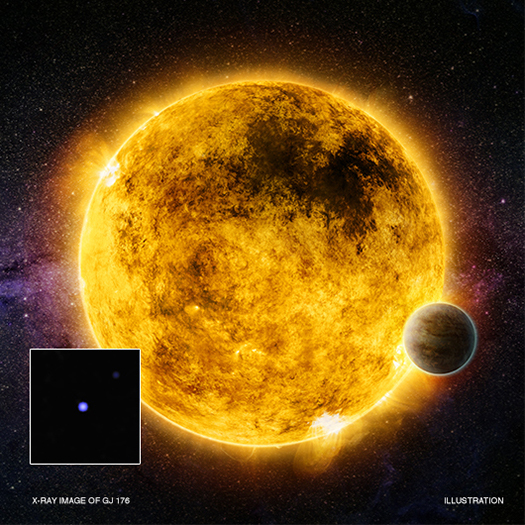 The rapid observed decline in X-ray brightness implies a rapid decline in energetic activity, which may provide a hospitable environment for the formation and evolution of life on any orbiting planets. “This is good news for the future habitability of planets orbiting Sun-like stars, because the amount of harmful X-rays and ultraviolet radiation striking these worlds from stellar flares would be less than we used to think,” said Rachel Booth, a graduate student at Queen’s University in Belfast, UK, who led the study.